I'm often inspired by the many artists who choose knitting as their medium. In this case I had a really hard time deciding on the images to post as they are all so beautiful. You can find Adrienne's site here. She has regular teaching events posted on her site and a link to her blog. 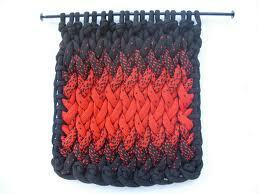 Adrienne says on her website; "Knitting shapes have long been defined by the human form. By moving the context of knitting from clothing geometry to sculpture, knitting becomes a medium with a link to a rich and complex fiber tradition that has the power of history behind it. 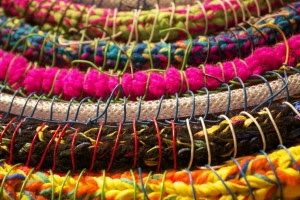 To be able to turn a single strand of yarn into fiber building blocks with form and function, texture and color is also energizingly low tech. 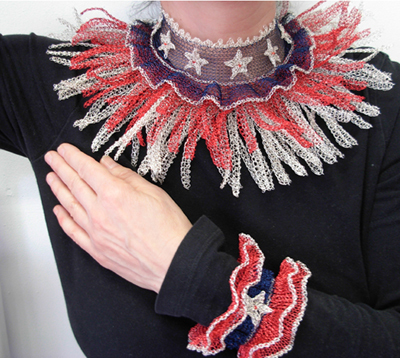 Working in what has long been considered a traditional woman's medium, I aim to an artistic aesthetic informed by traditional craft, art and politics. My work aspires to dissolve the boundaries between craft and art, mindful of the historical context of the medium. I knit to rejoin the frayed and unraveled places around me."